As Meredith Osborn mentioned during our first brainstorming session, "The team name is the hardest part.” She was not wrong! For the first few days, we were all over the map with ideas from Vicodin Withdrawal to Fusion to Creative Cosmos and many more. As we were trying to figure out what to call ourselves, we soon learned that Zac not only is a mean copywriter, but he can also strum out some epic tunes on the guitar. 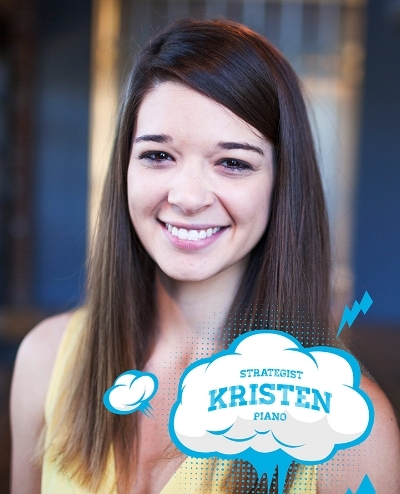 Meanwhile, Kristen is able to bring the heat by adding piano to our sound, all the while pumping out some incredible strategies for our campaigns. Nijaz chimed in about how he can play the drums (sort of) — at the very least he says he can keep a beat with his hands, which works for us. Using those same hands he’s able to develop some truly rock-star graphics as our Art Director. Then there’s me, Sara, who has been singing and writing song lyrics most of her life, which translates into my ability to develop some interesting content. It didn't take long before the jokes about starting a band sponsored by HLK began rolling out. Next thing we know, Torie was stepping up to expand outside of her Account Manager position to be our band manager as well. Maariya decided to use her skills as our Media Strategist and become our event coordinator. This way, we can find the best places to perform that will reach the most people. Finally, Mikayla offered to use her mad Developer skills and help us design our website... or be our groupie. We would have been happy with either choice. Then we proceeded to take this idea a step further and define our musical category by mashing together a bunch of random genres that normally wouldn't mix. Without further ado, I present to you the newest HLK interns and upcoming psychedelic-country-soul band: Infinite Velocity. We want to capture something that will be long-lasting (infinite) and innovative. We're going to have to work at the speed of light (velocity) since we only have three weeks per project to put everything together. We're all extremely excited about these projects and are grateful to the HLK employees who have been and will be guiding us along the way. We're also very grateful to those who have been helping point us in the correct direction when we get lost. If you see any of us, feel free to reach out and say hi, ask for an autograph, or just hang out. We love meeting new people and are happy to be a part of the HLK team!